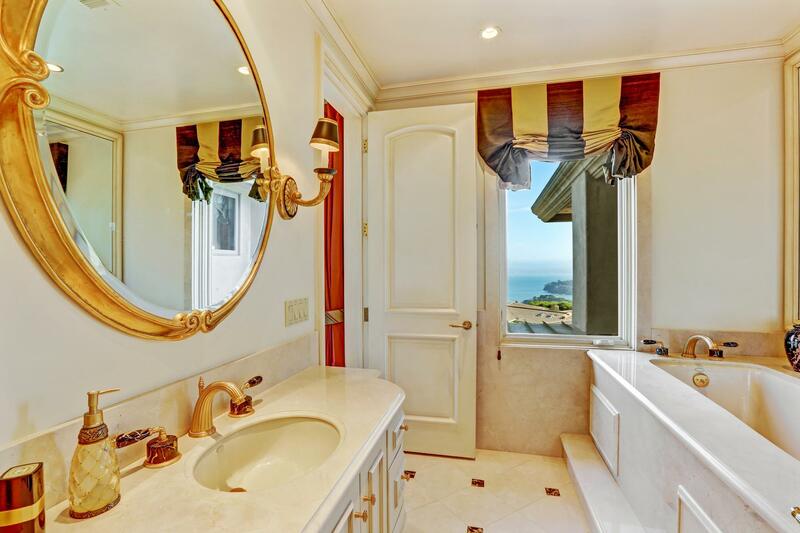 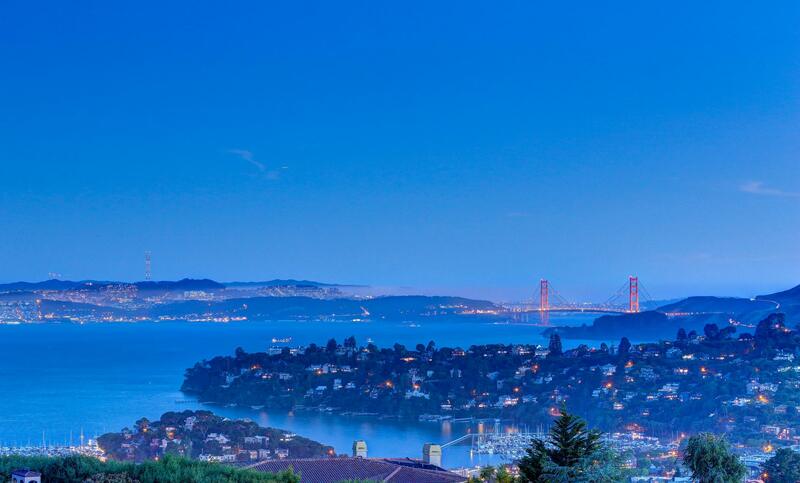 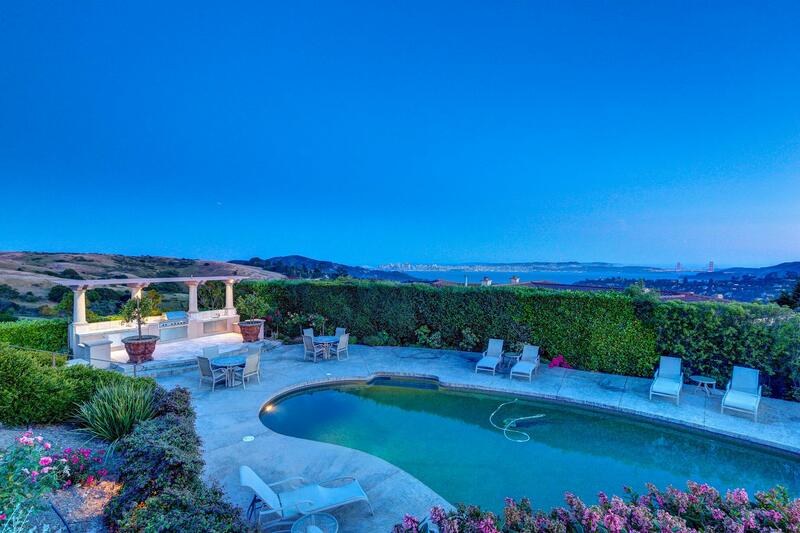 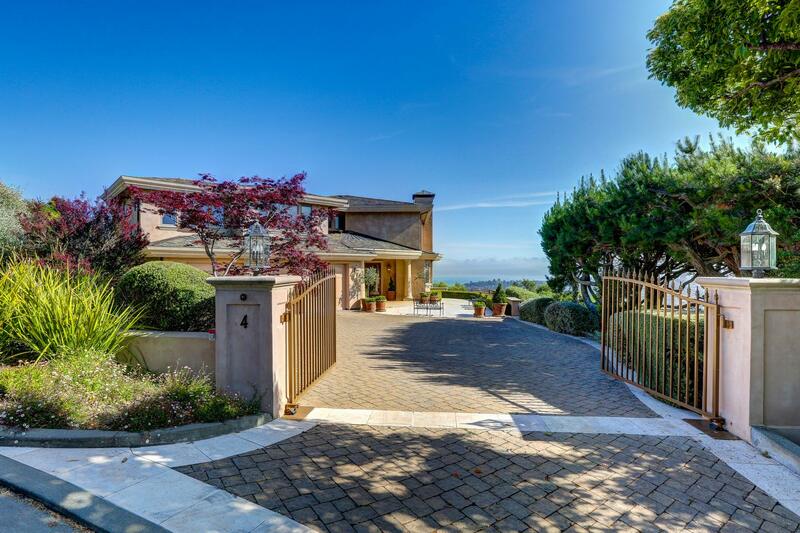 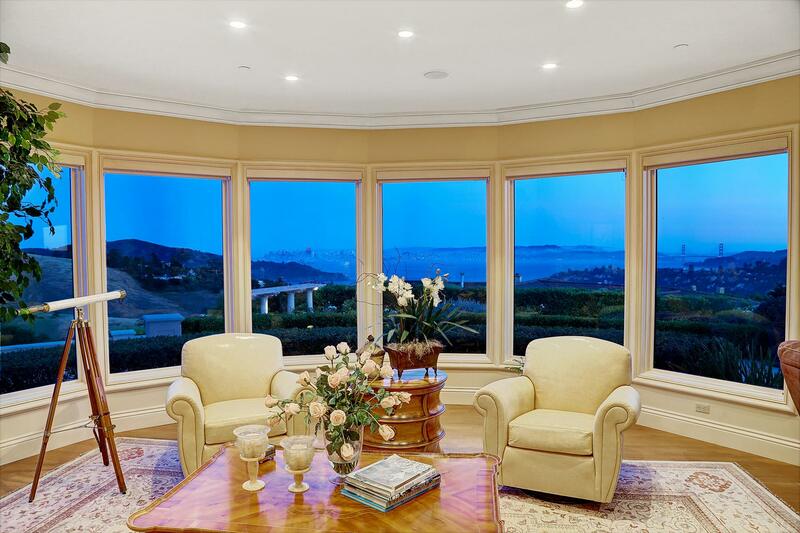 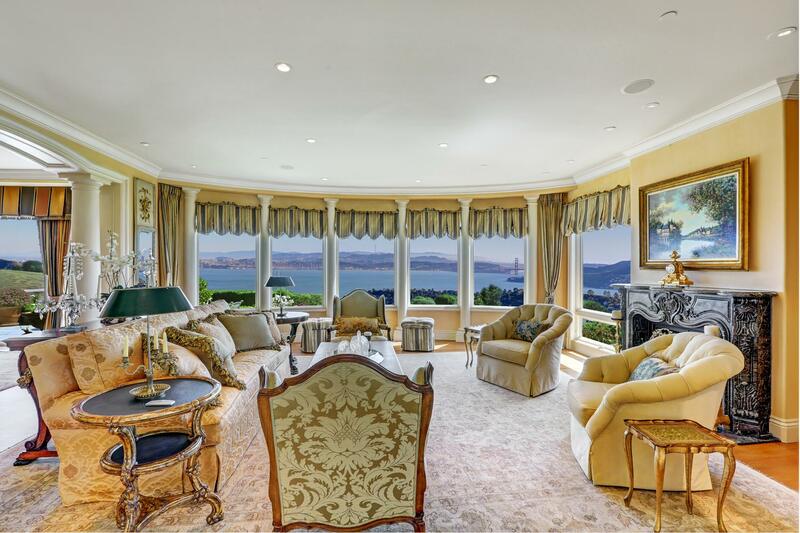 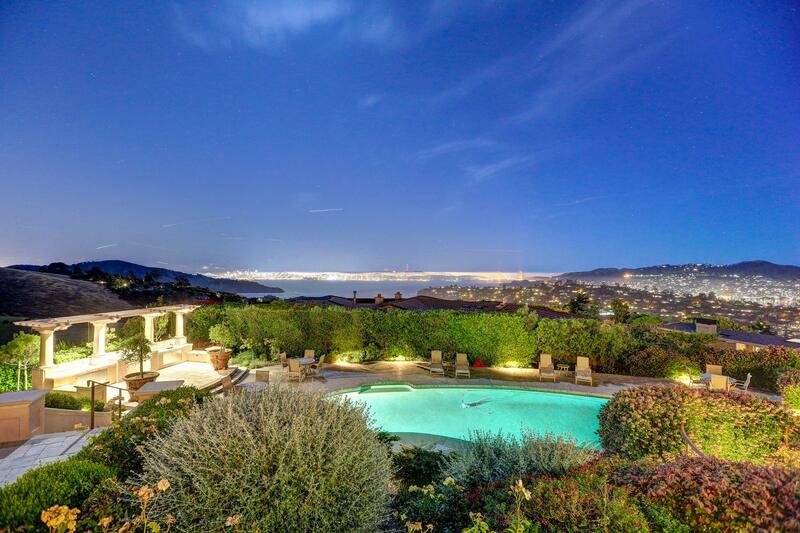 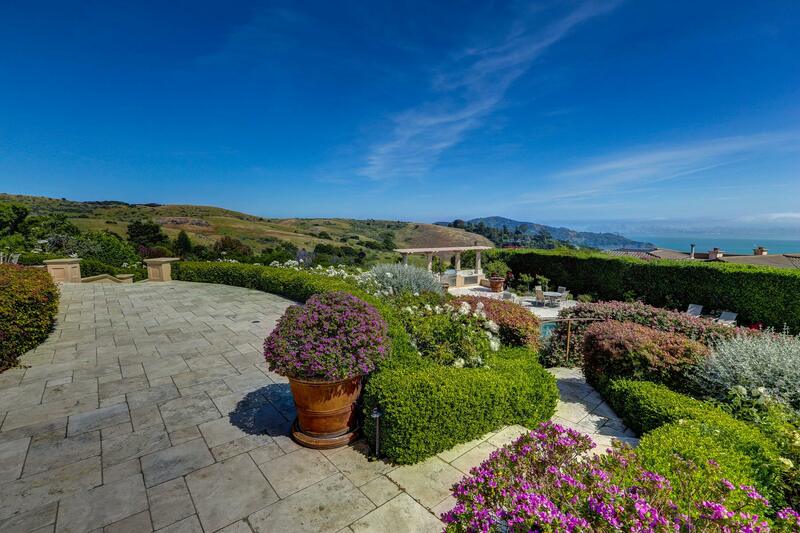 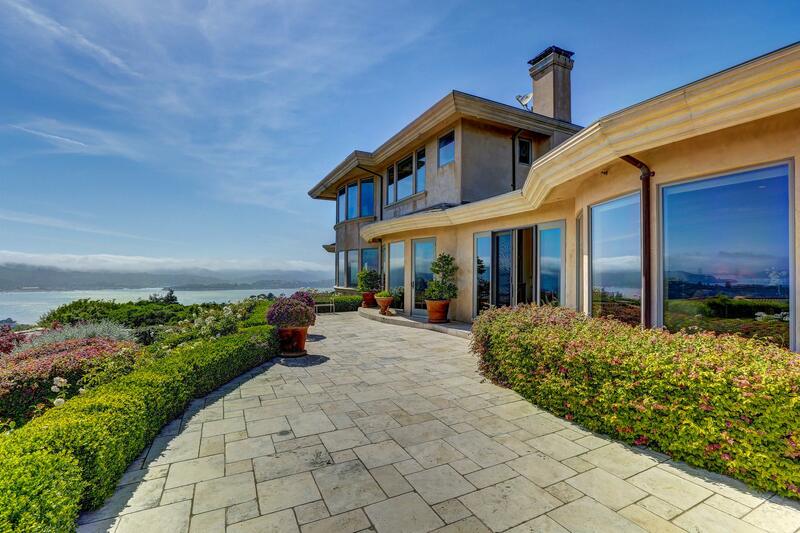 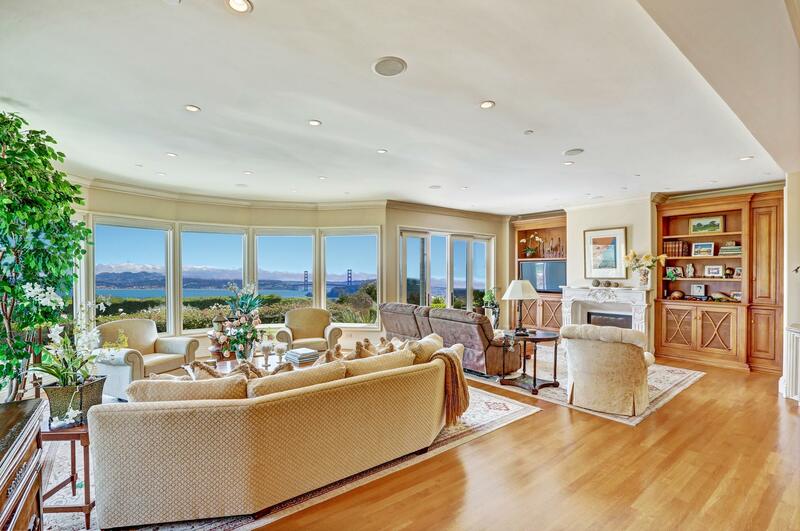 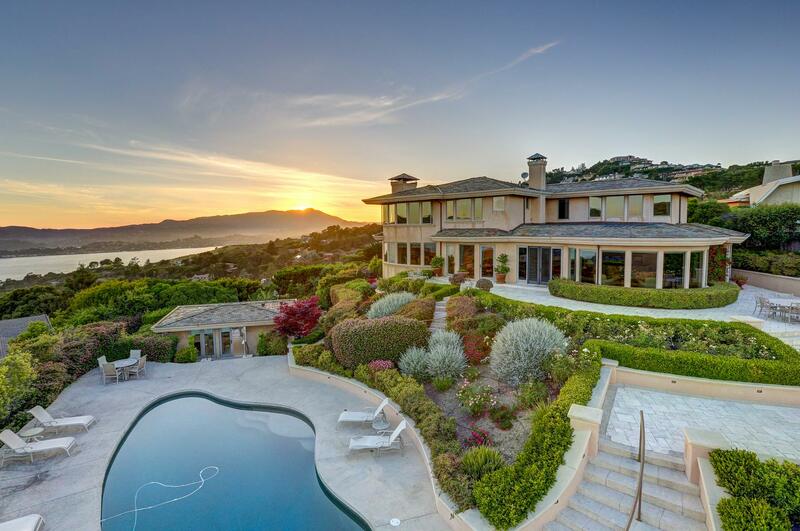 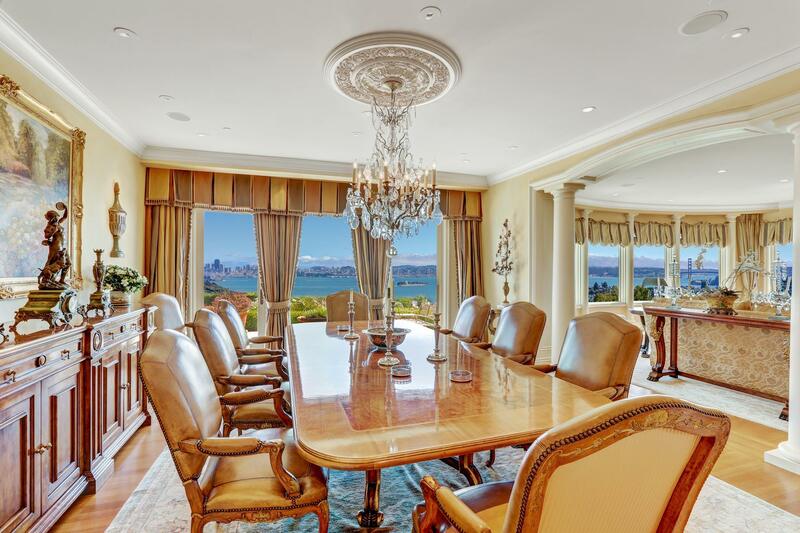 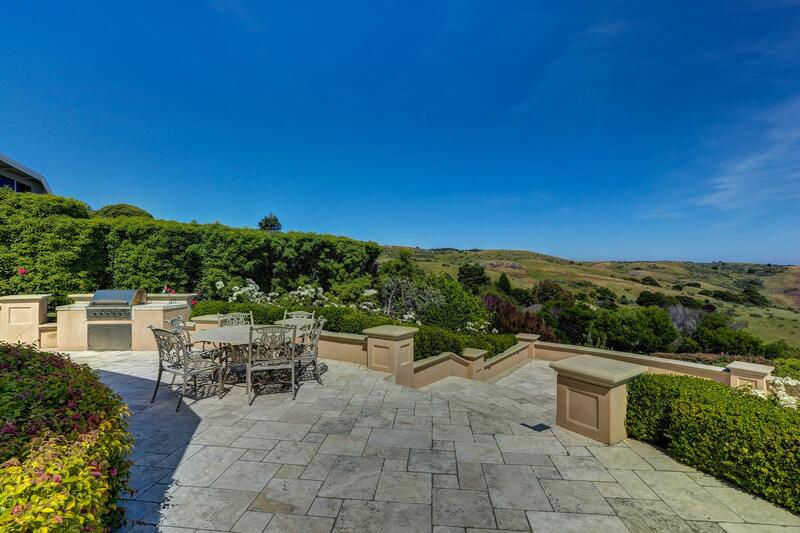 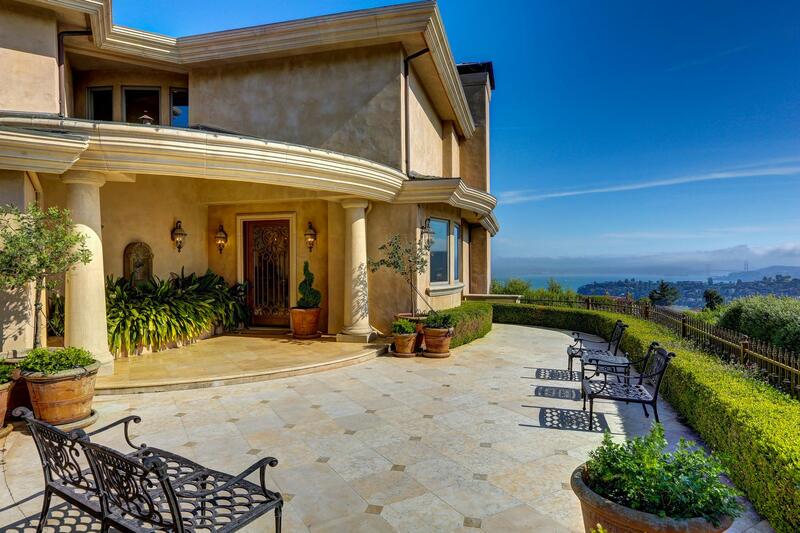 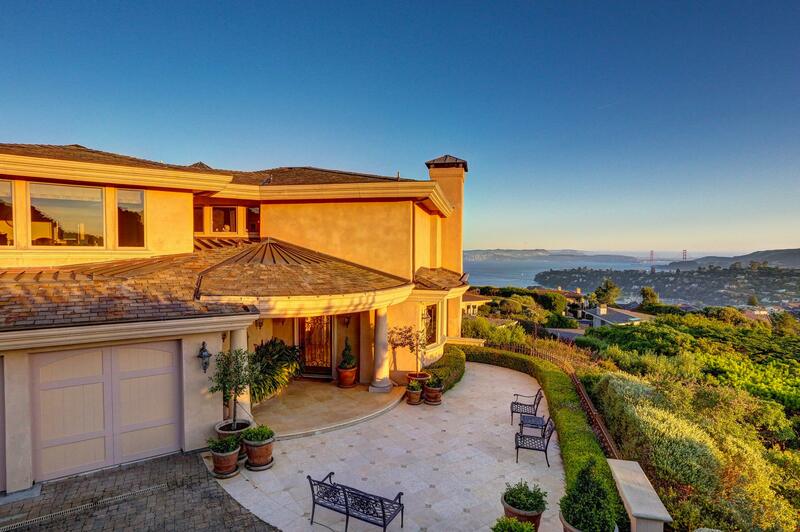 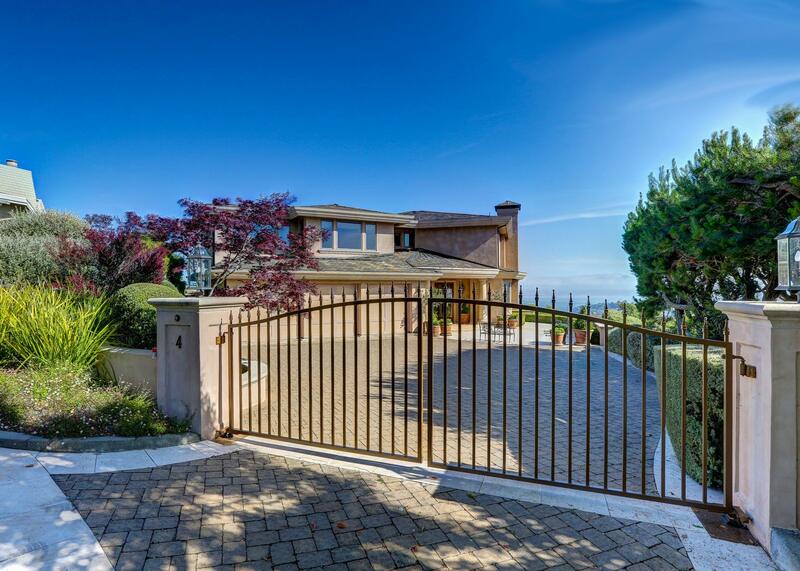 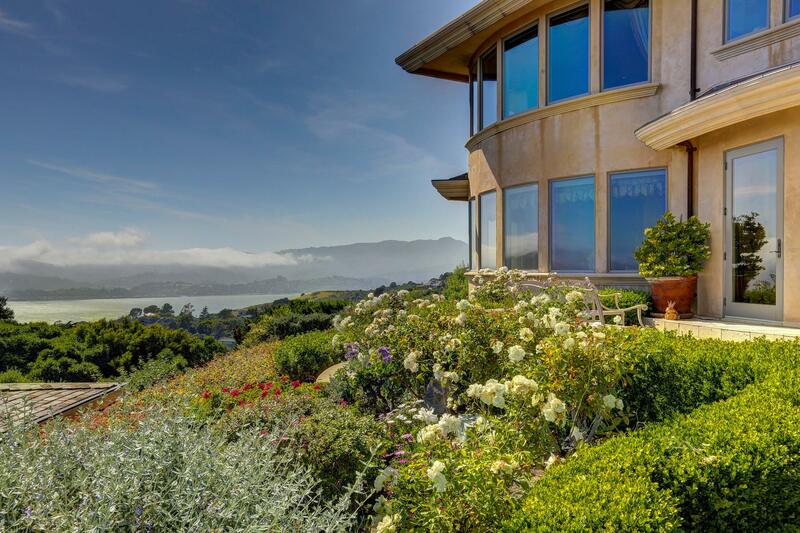 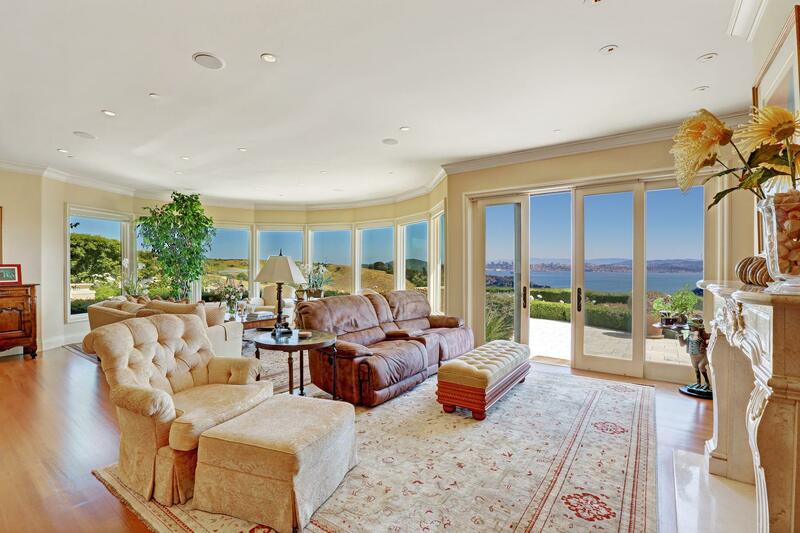 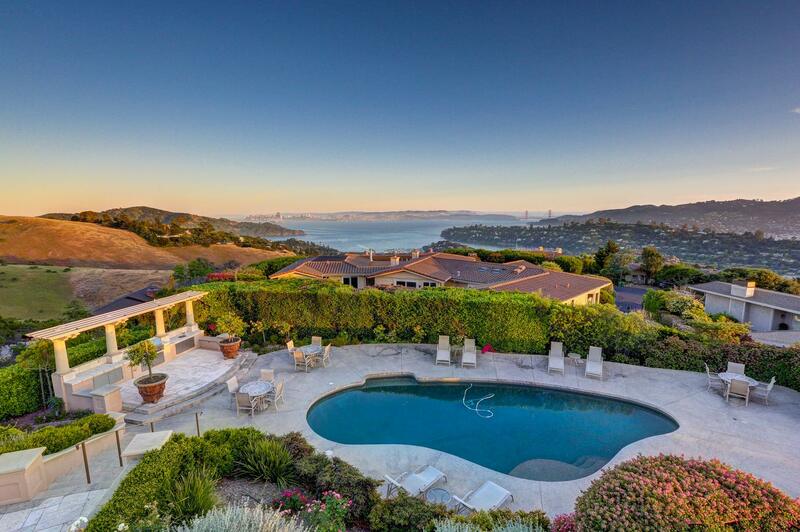 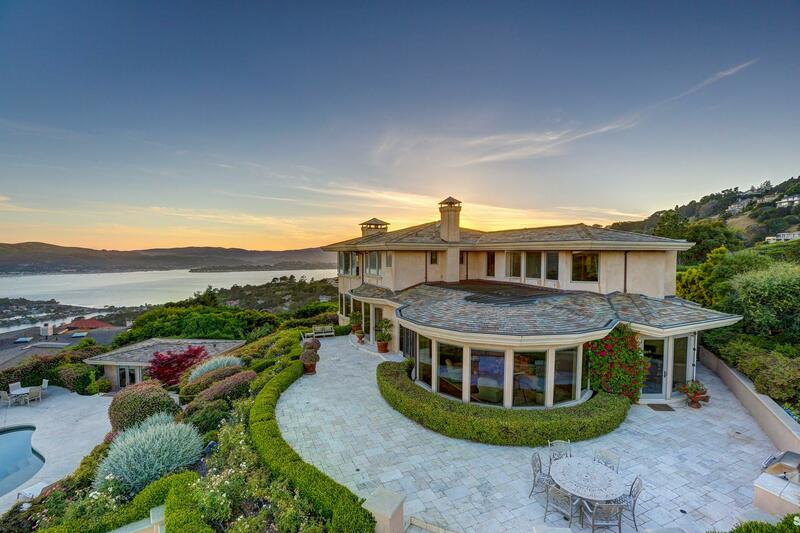 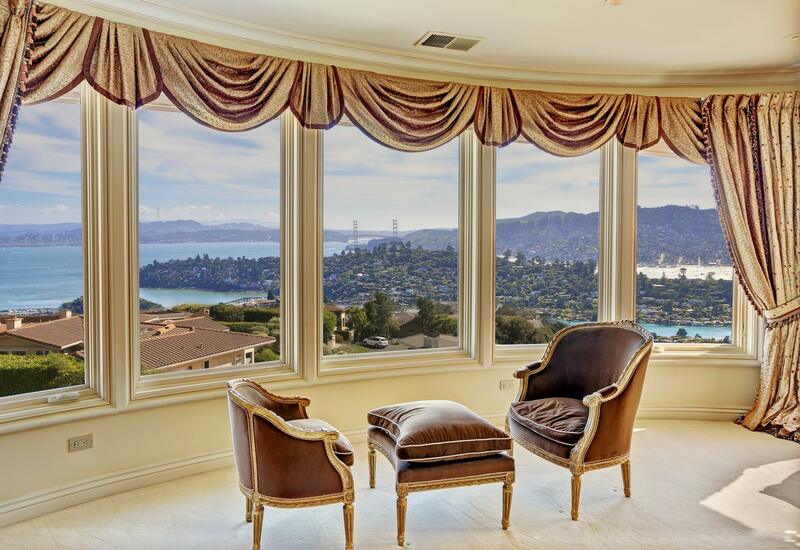 Breathtaking views and classic elegance define this world class property in the hills of Tiburon. 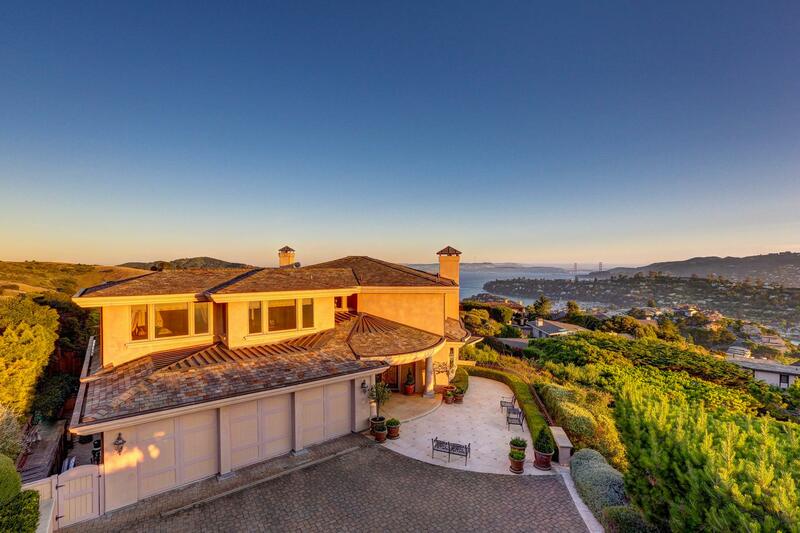 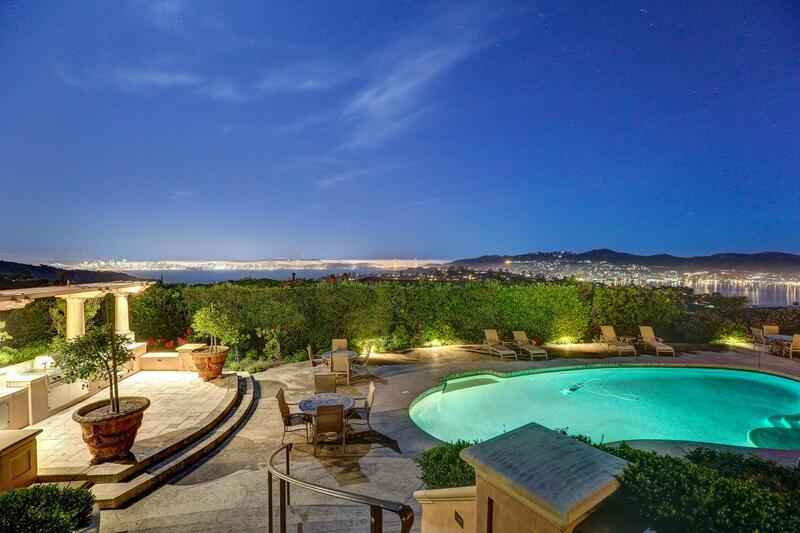 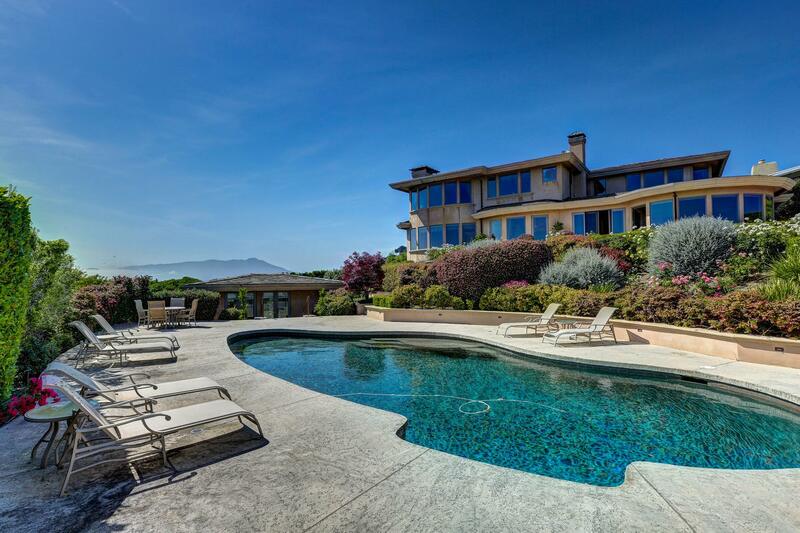 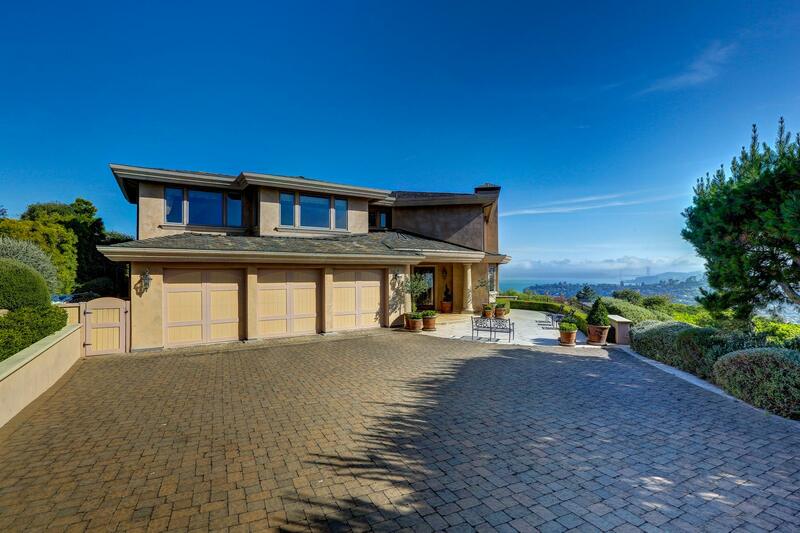 In one of the most desirable locations in the San Francisco Bay Area, this home, custom built in 2001, offers luxury living, spectacular vistas and grand outdoor entertaining spaces. 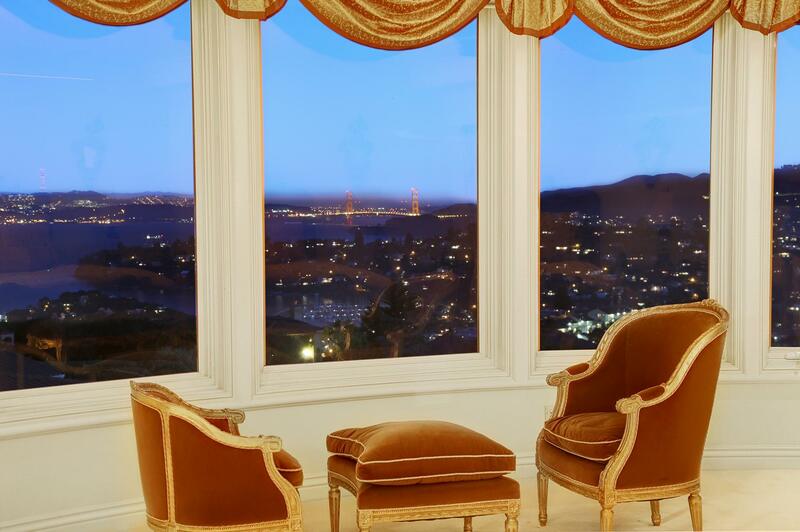 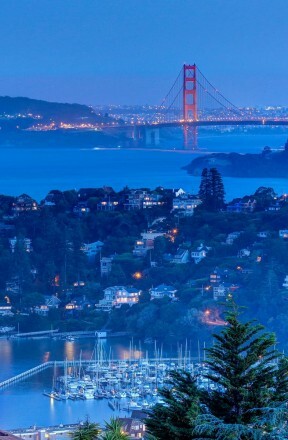 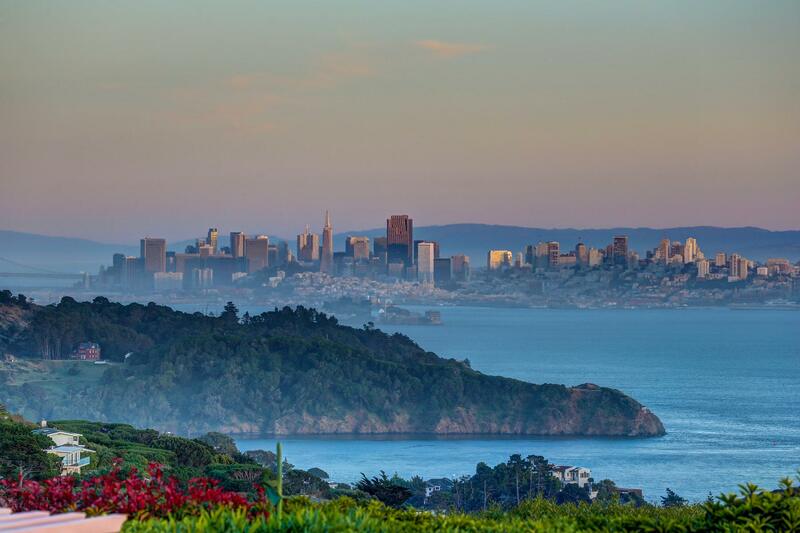 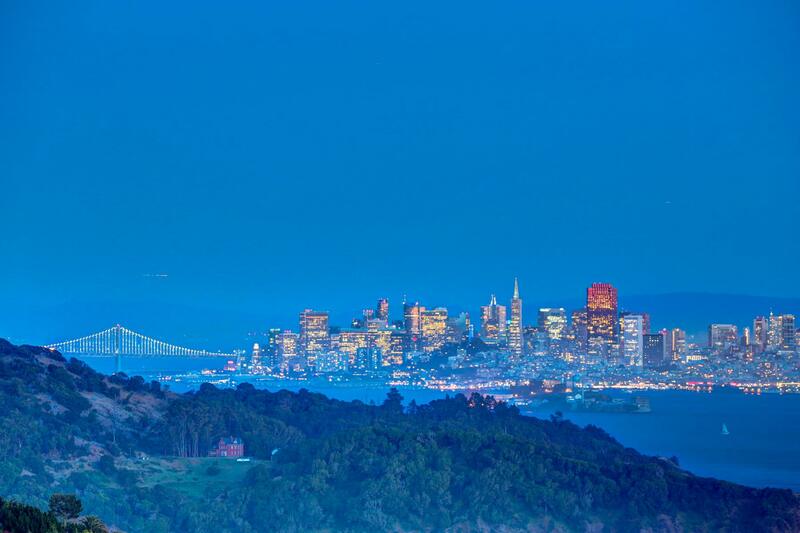 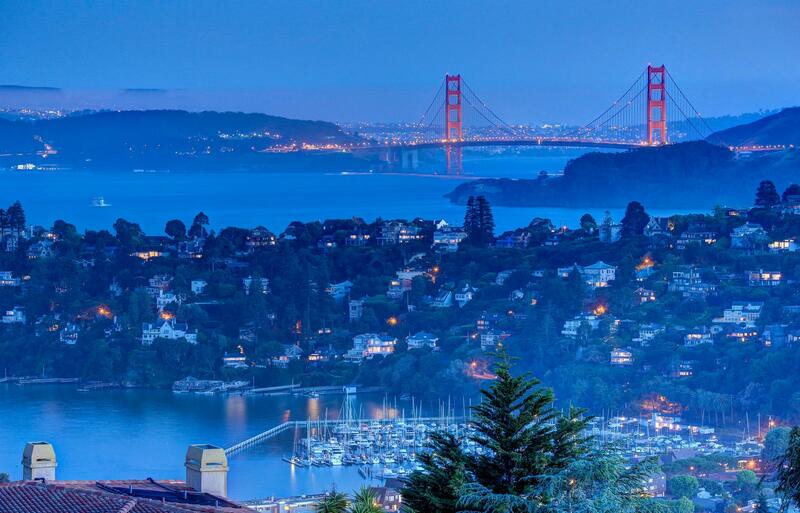 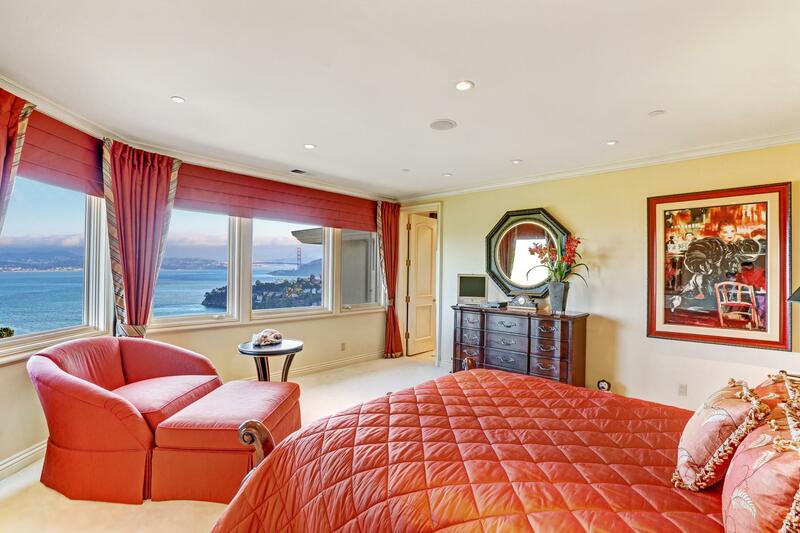 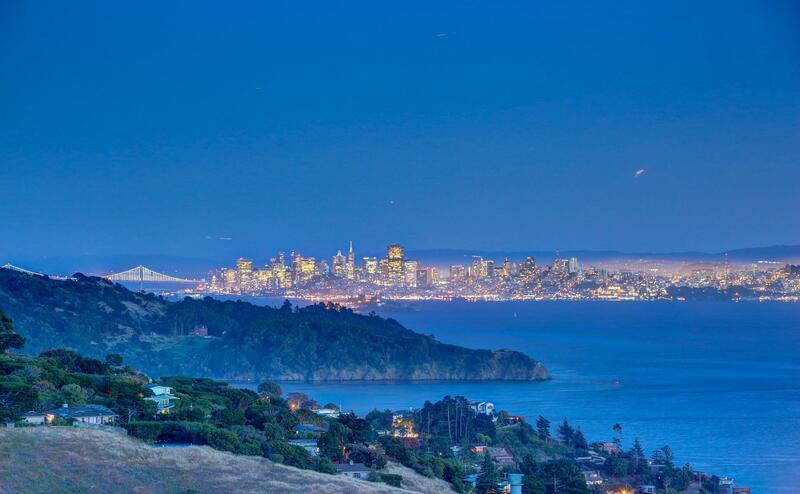 Enjoy incredible views of the Golden Gate Bridge, downtown San Francisco, Bay Bridge, Mt. 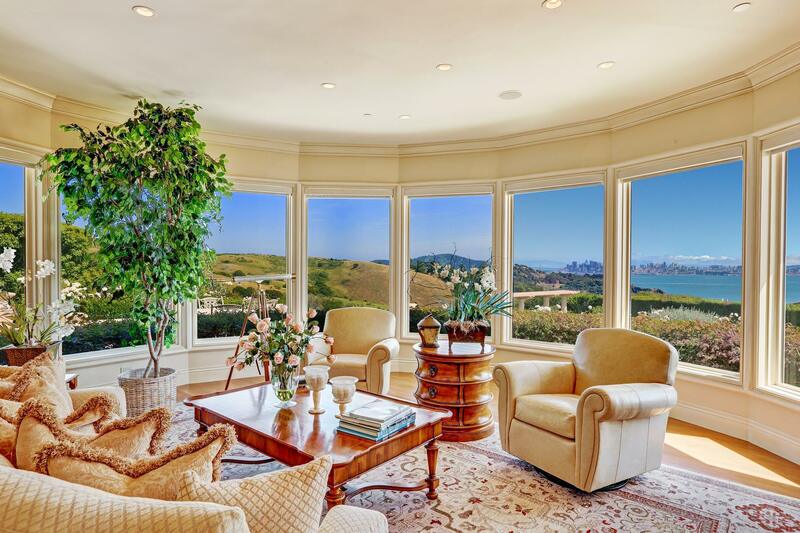 Tamalpais, Angel Island and the San Francisco Bay from every living area. 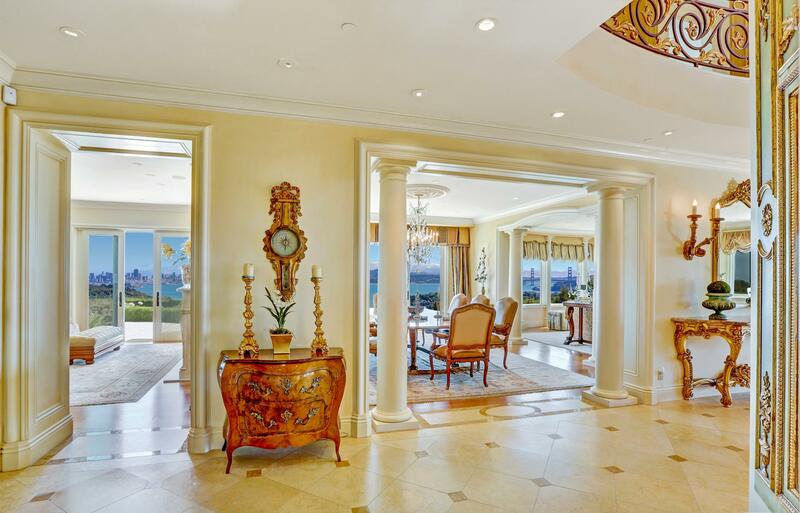 Glass doors open to expansive, lushly landscaped grounds, outdoor patios and terraces. 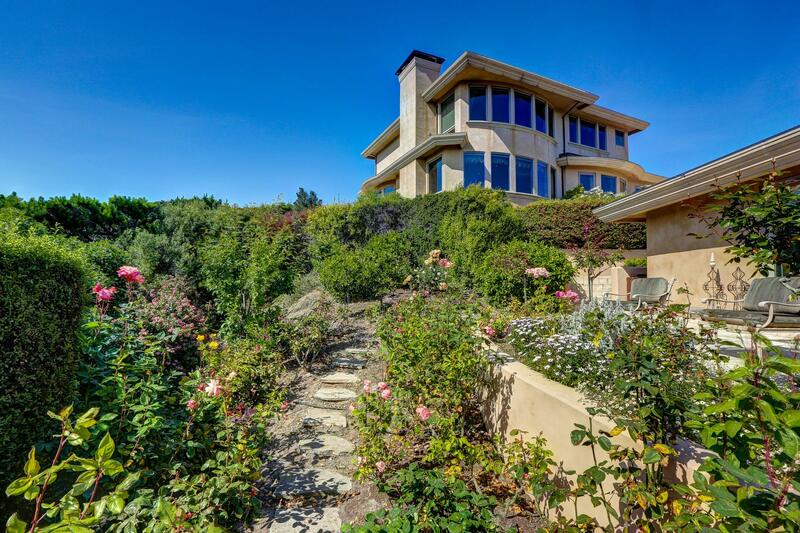 Outside the home, winding pathways lead to outdoor living spaces and a pool house with full bathroom. 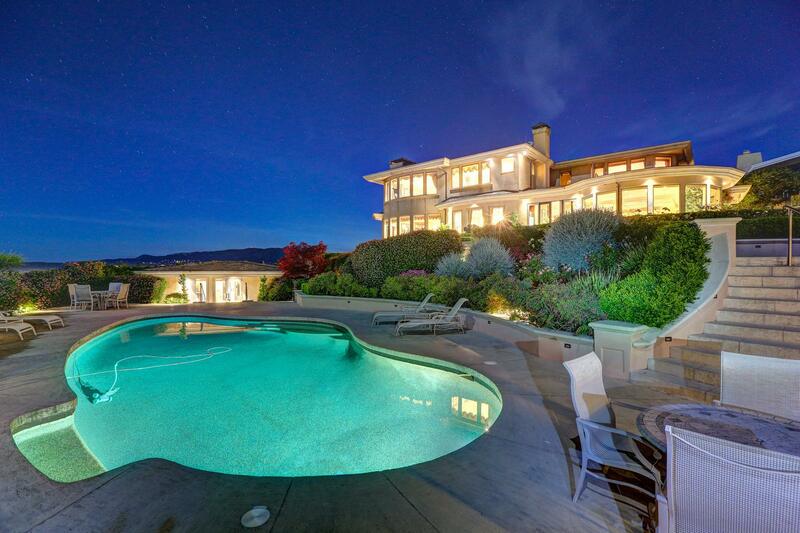 The pool, set on a large deck, is screened by mature landscaping, and is secluded and private. 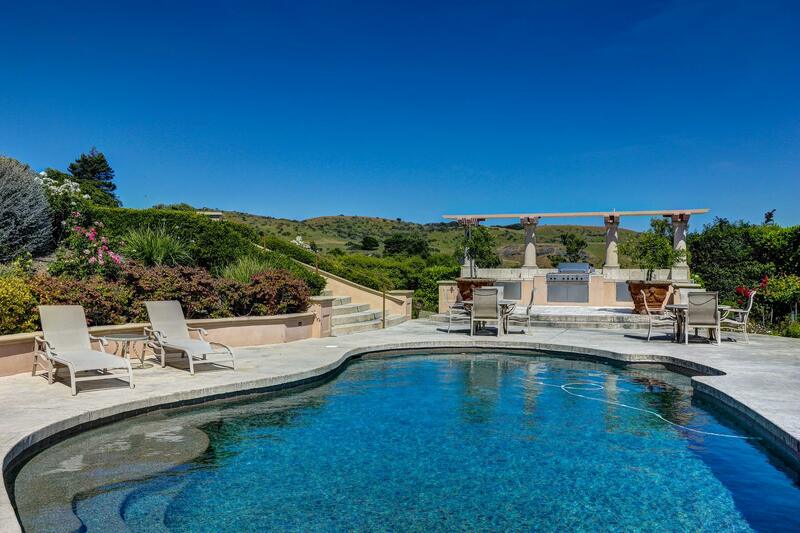 The beauty of tumbled marble tiles defines an outdoor kitchen and barbecue area adjacent to the pool, with ample space to entertain and relax. 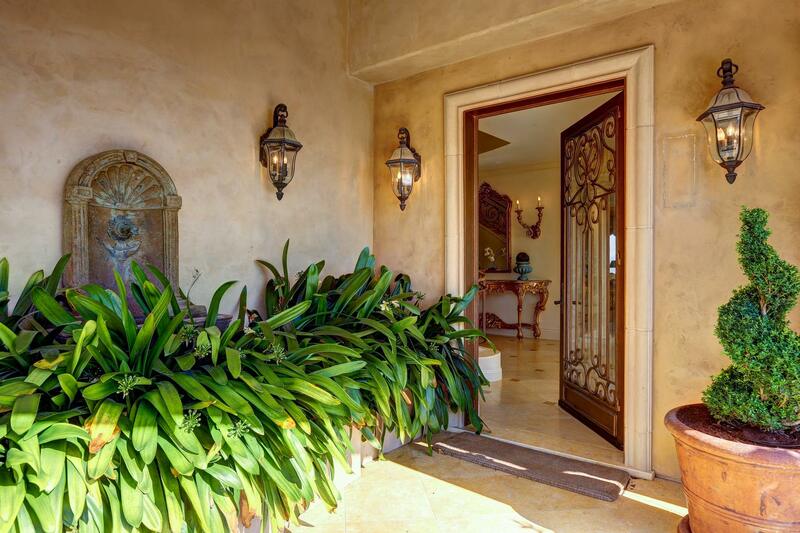 Enter the home through a custom made glass door with hand crafted wrought-iron work. 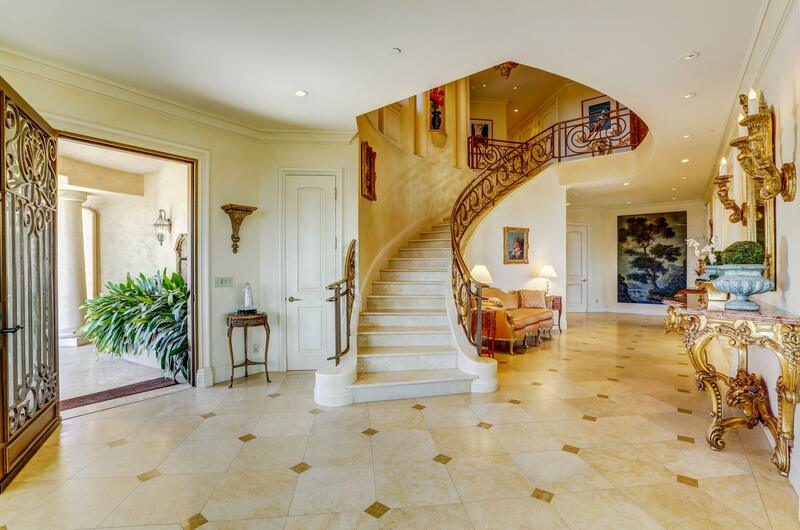 The dramatic double height entry hall features limestone and a graceful curved staircase. 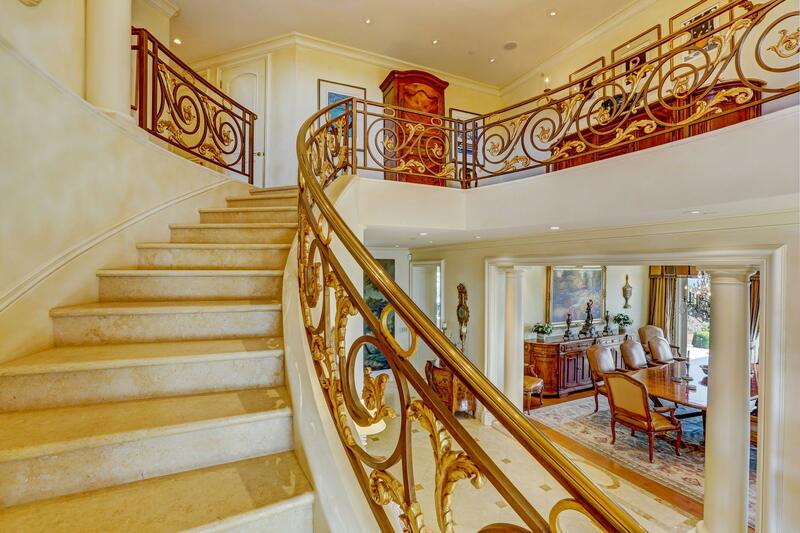 Custom wrought-iron and gold leaf accent the railings and continue up to the second floor where they define a gallery space overlooking the foyer. 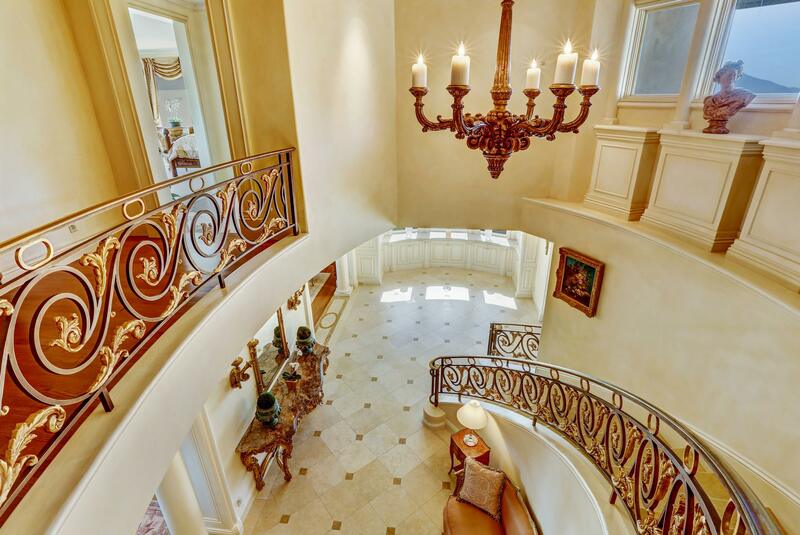 An antique chandelier is the focal point in this elegant space. 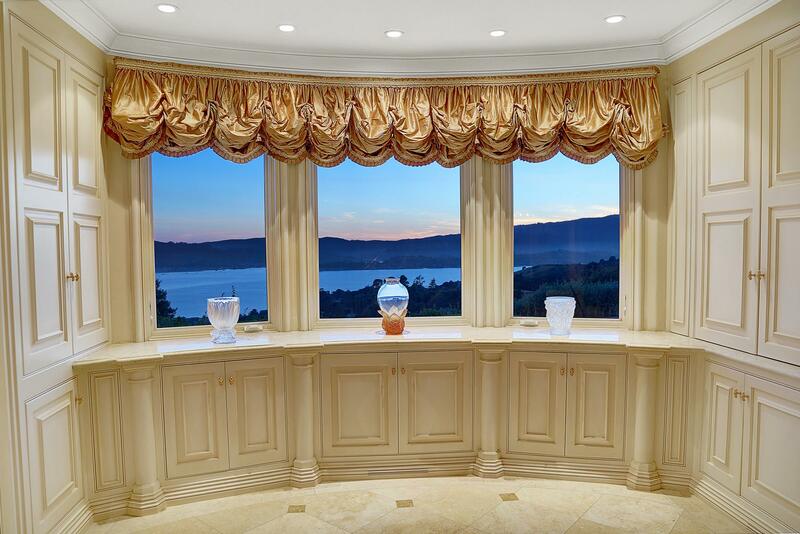 This residence is a jewel in one of the most magnificent settings in the world. 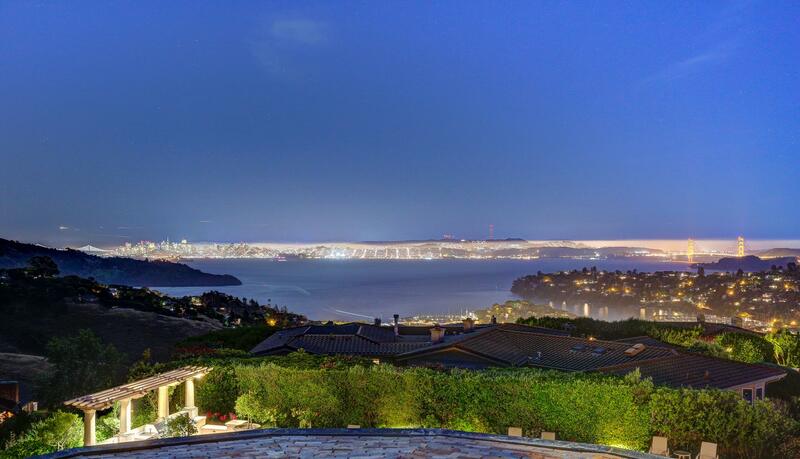 Close to world class dining, recreation and nature, with close access to cultural activities, museums and theater, this family home offers beauty, comfort and serenity high above the beautiful San Francisco Bay Area. 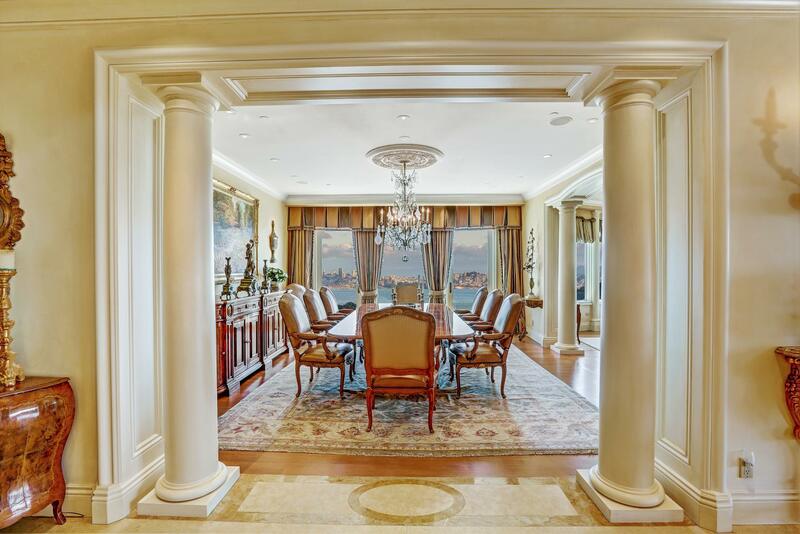 A formal living room with a sculpted grey marble fireplace and a curved wall of windows flows into the formal dining room with glass doors opening to one of several terraces. 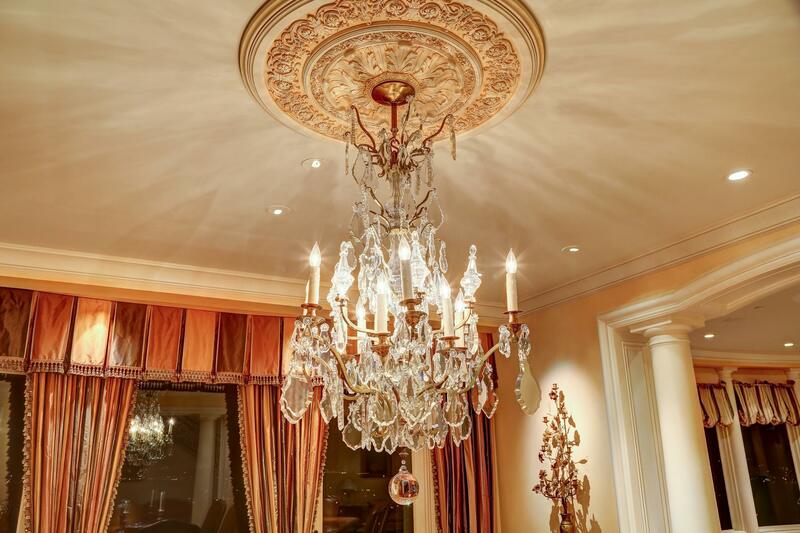 An antique French crystal chandelier adds soft lighting to the space. 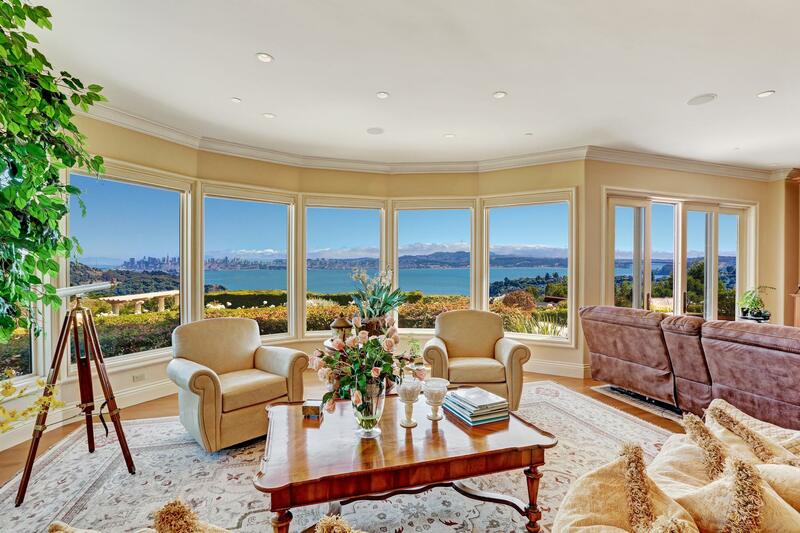 Crown molding throughout and windows trimmed with woodwork frame the amazing views of the San Francisco Bay Area, Tiburon and Belvedere. 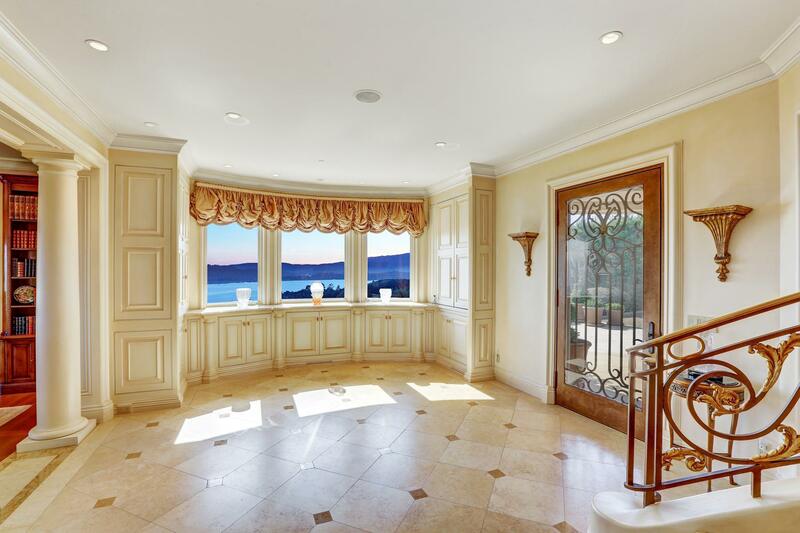 The centerpiece of the kitchen is the island, crowned with an oversized single slab of granite. 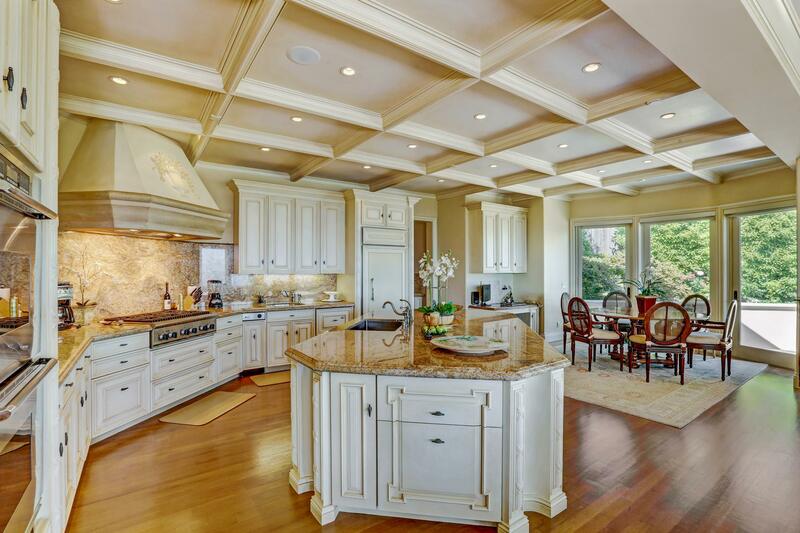 Two Dacor ovens, two sinks, Sub-Zero refrigerator and a six-burner Thermador stovetop make this a true chef’s kitchen. 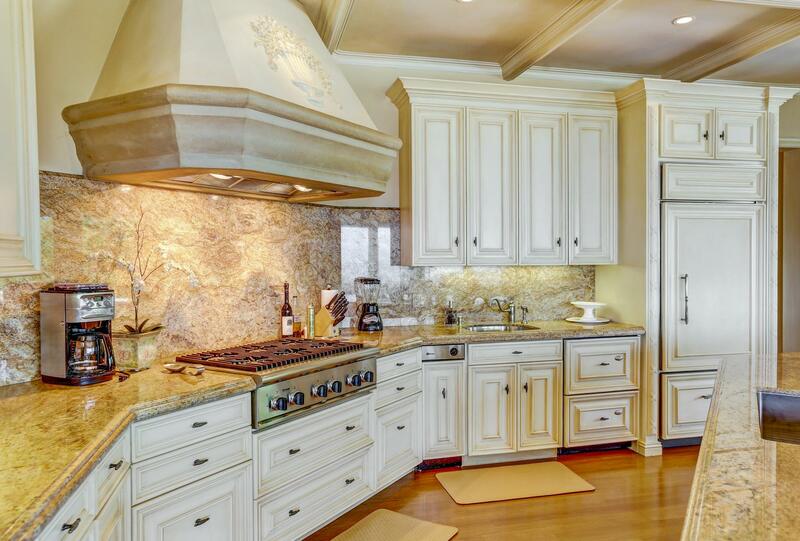 Granite counters and backsplashes and custom bas-relief artwork on the range hood and island side facing the family room add drama and beauty to the space. 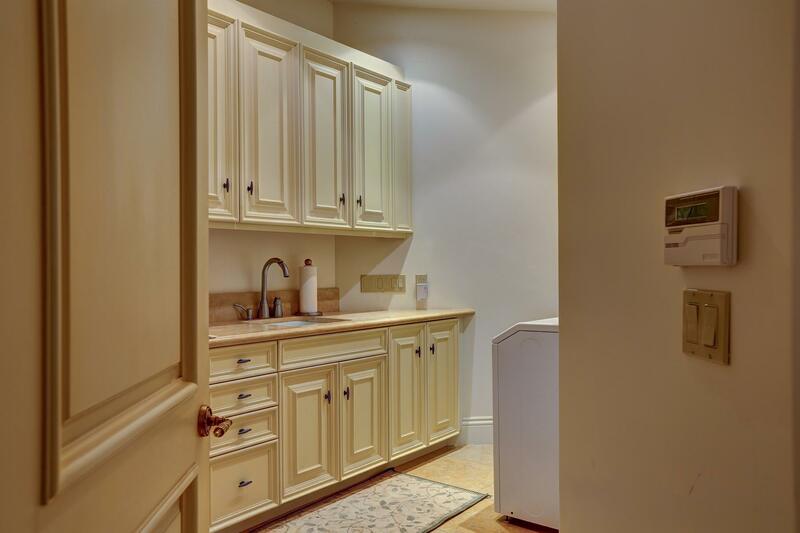 Adjacent to the main kitchen area is the butler’s pantry, with a second refrigerator, wine cooler, freezer drawers and built in cappuccino machine. 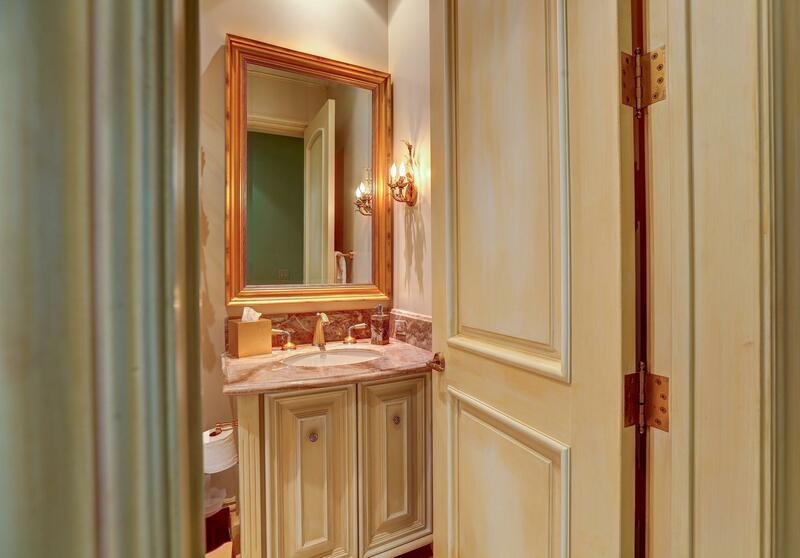 Wood cabinetry throughout provides ample storage and is fitted with custom designed hardware. 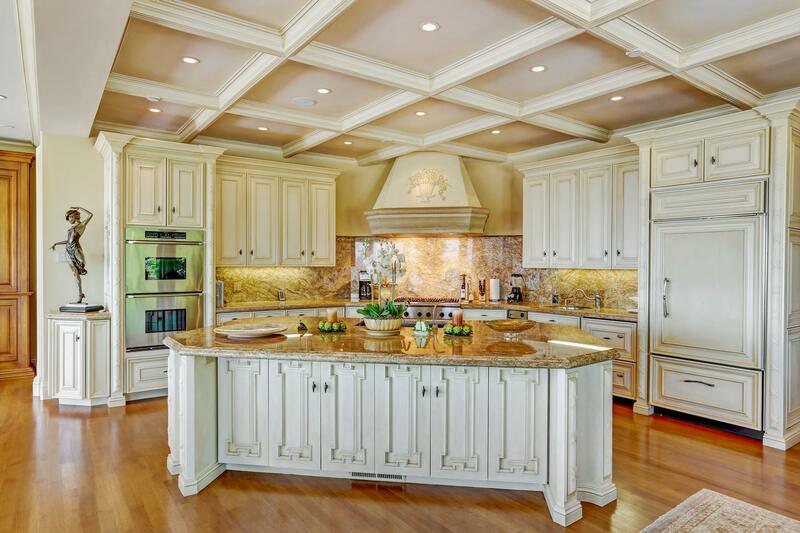 A coffered ceiling defines the kitchen and casual dining area. 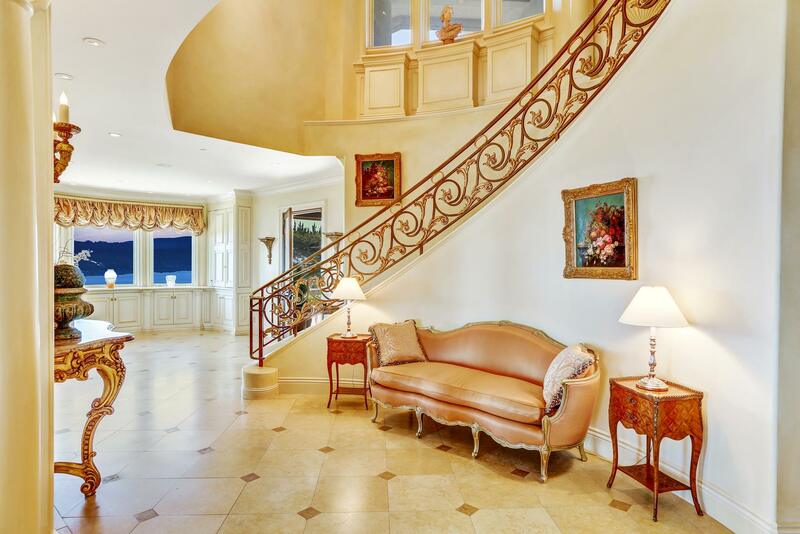 This leads to a terrace with a built-in barbecue and space for al fresco dining. 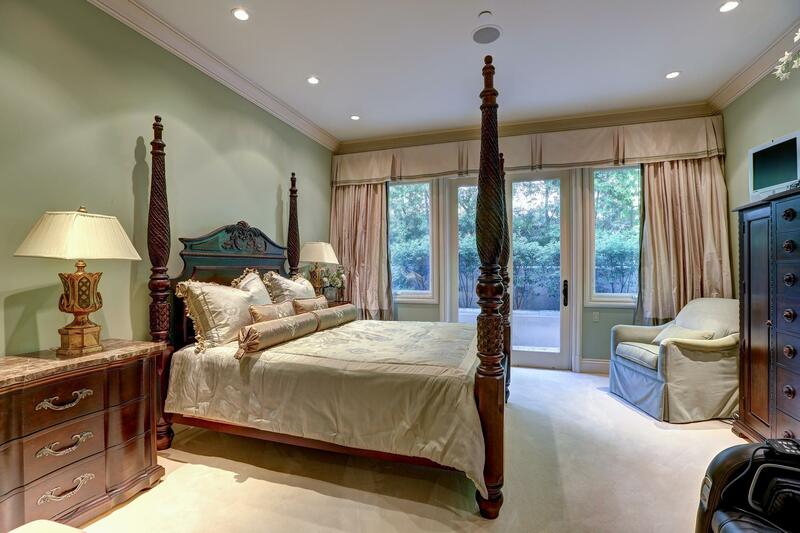 A fifth bedroom with full bath is a versatile space that could be library, office, den or media room. 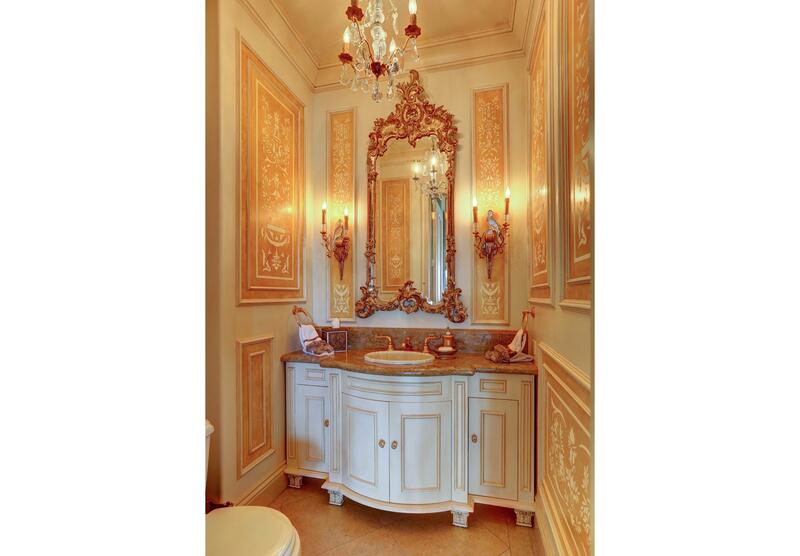 Exquisite finishes and details dress up an elegant powder room on this level. 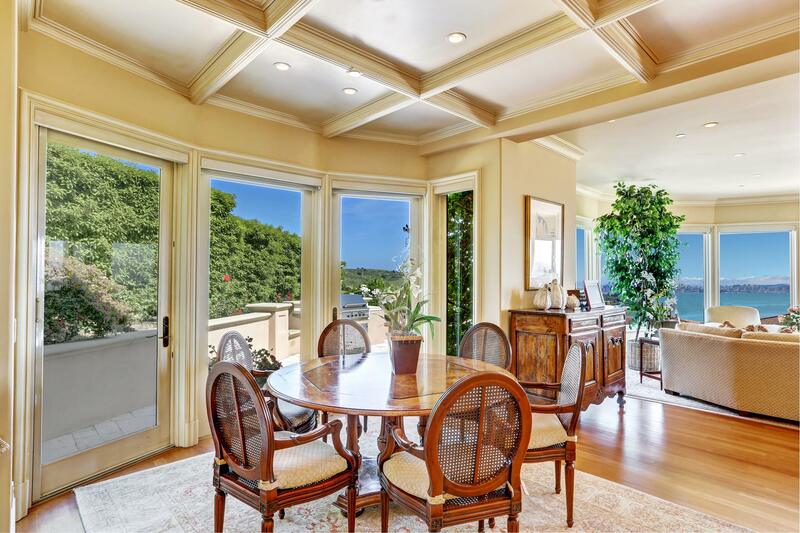 Ten foot high ceilings create an open and spacious feeling in every room on the first level of the residence. 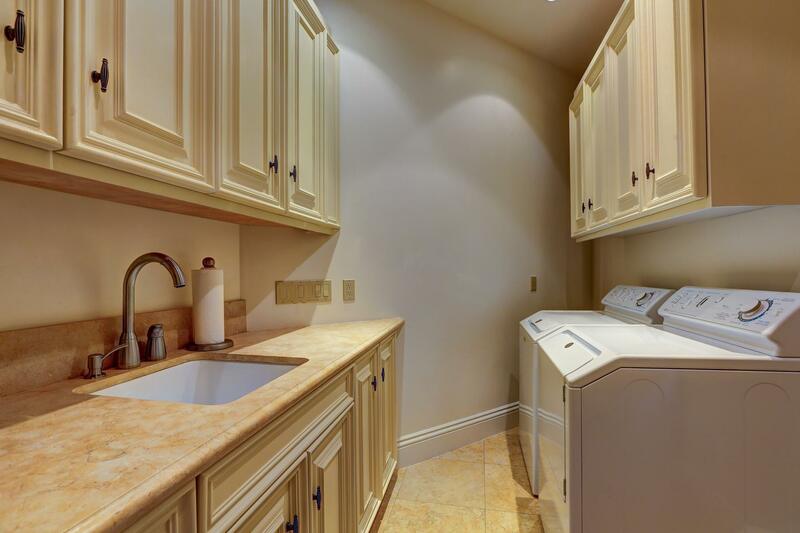 Also on the main level is a well-appointed laundry room with sink and a three car garage. 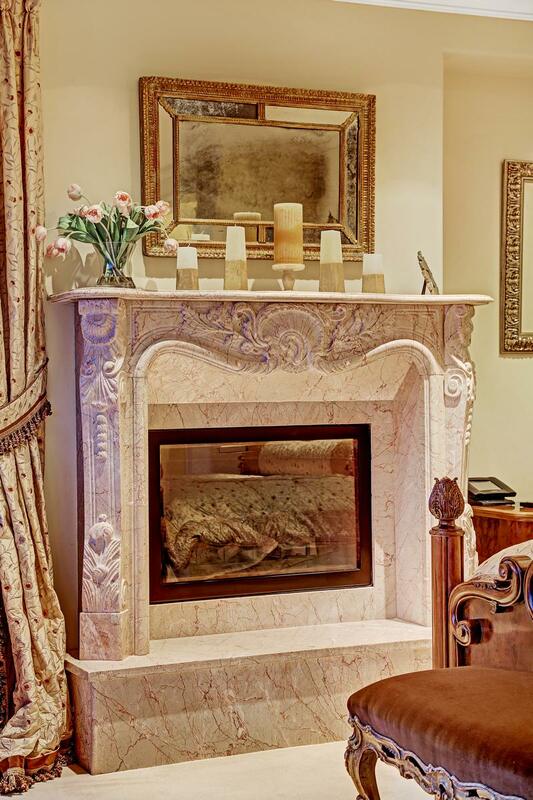 There are two master suites, one with marble fireplace, and each with full bathroom and walk-in closets. 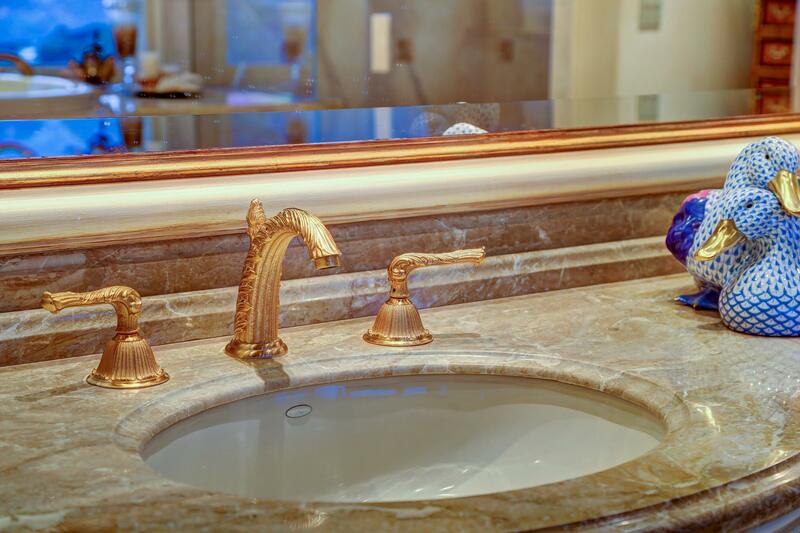 The spa-like primary master bath offers double sinks, mirrored vanities with curved fronts and custom designed marble handles. 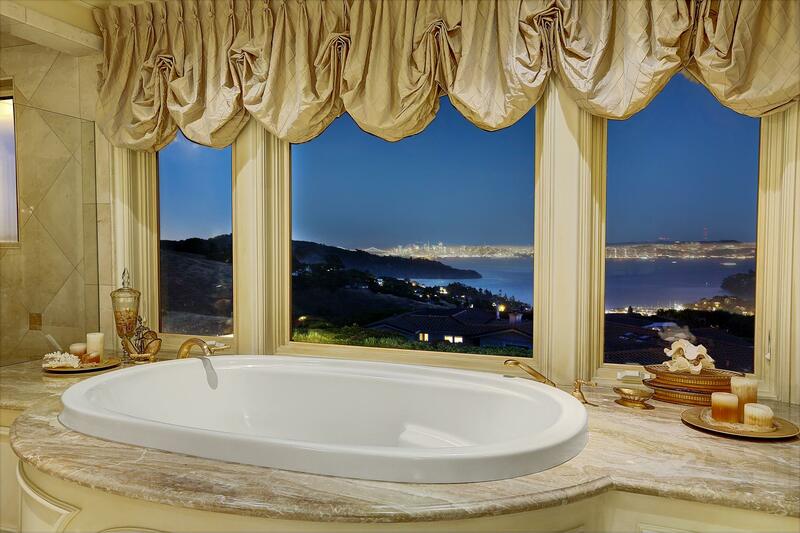 A large oval tub set on a marble platform overlooks the bay and open space, inspiring contemplation and relaxation. 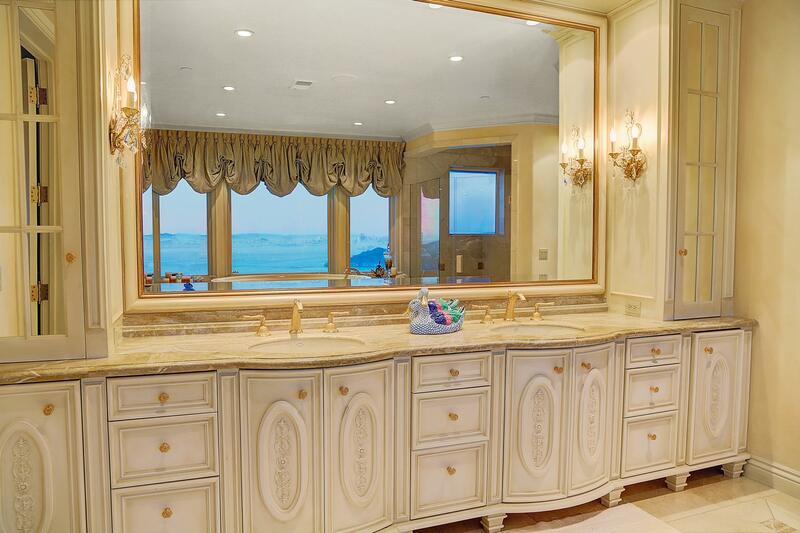 The glassed-in shower also offers an amazing view. 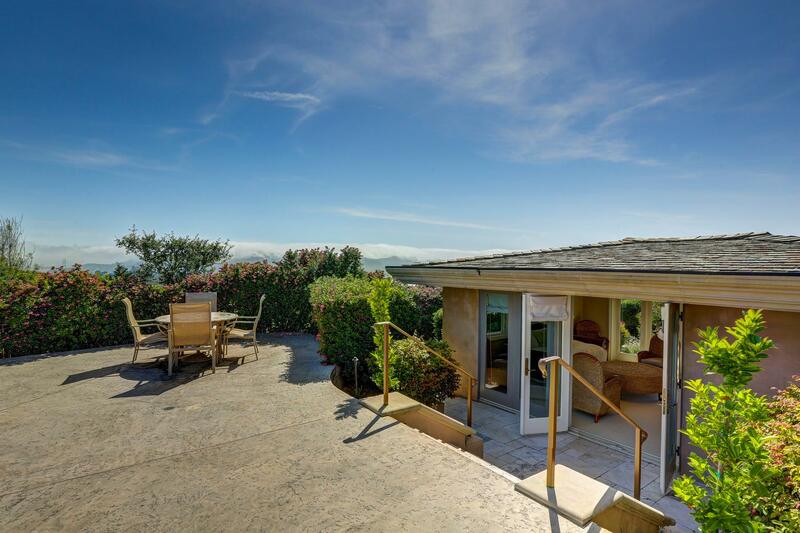 Two additional bedrooms with full bathrooms are on the second level. 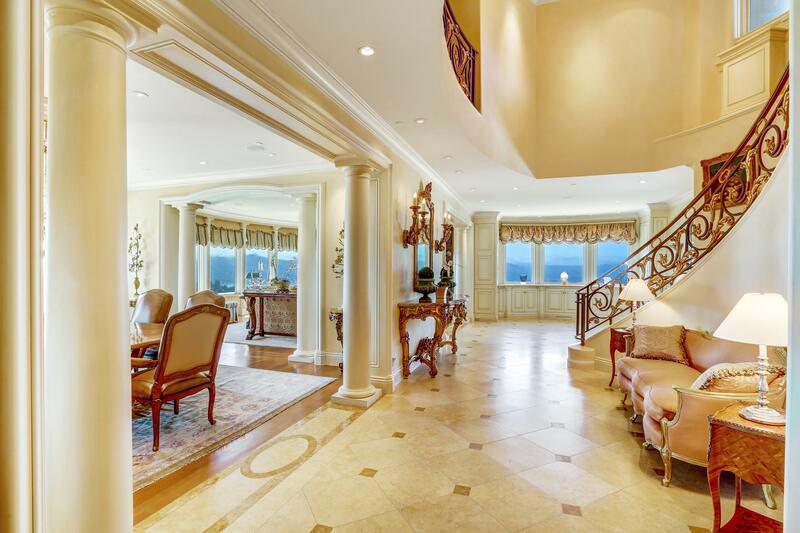 The hallways are marble and oak hardwood flooring while closets are carpeted. 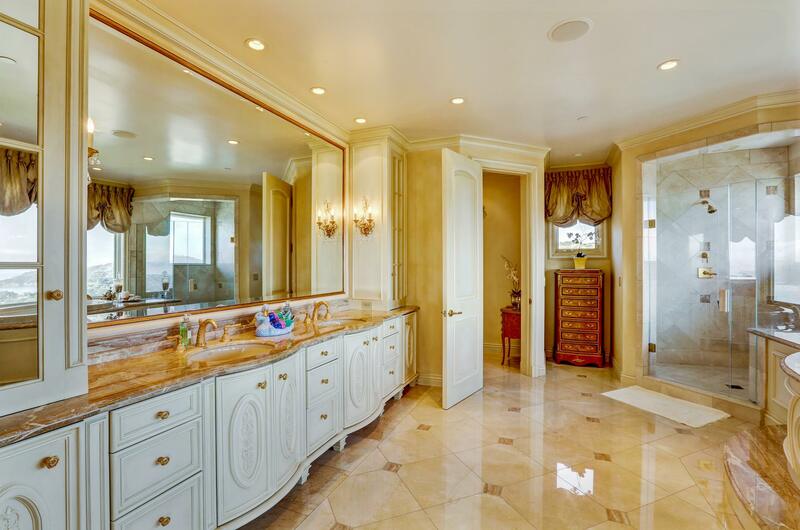 Large finished areas provide easy access to organized storage. 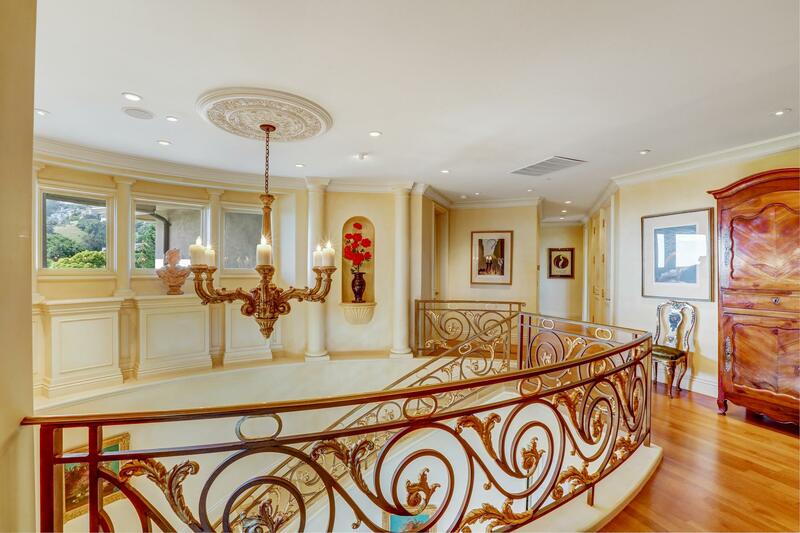 The pool house has a marble bath, sitting area and private patio. 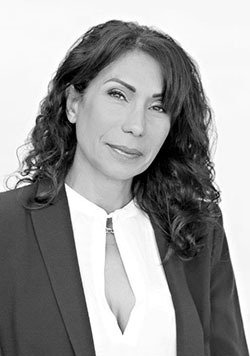 DISCLAIMER: The information set forth on this site is based upon information which we consider reliable, but because it has been supplied by third parties to our franchisees (who in turn supplied it to us) , we cannot represent that it is accurate or complete, and it should not be relied upon as such. 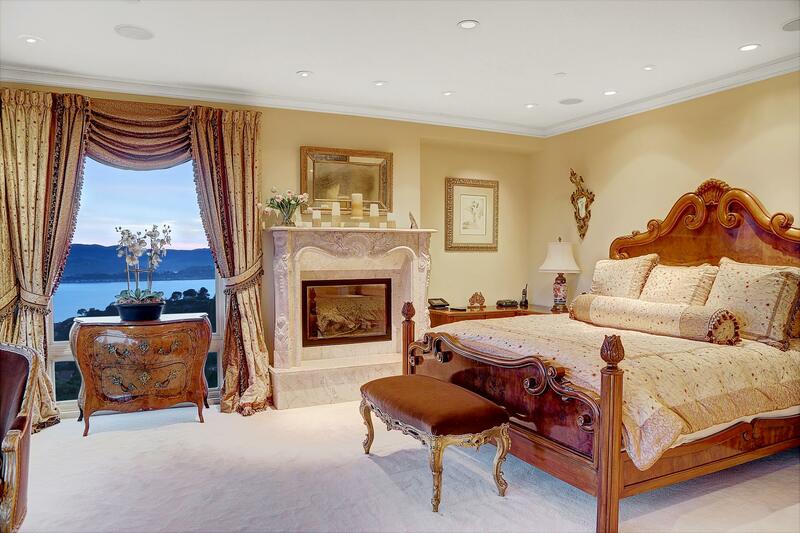 The offerings are subject to errors, omissions, changes, including price, or withdrawal without notice. 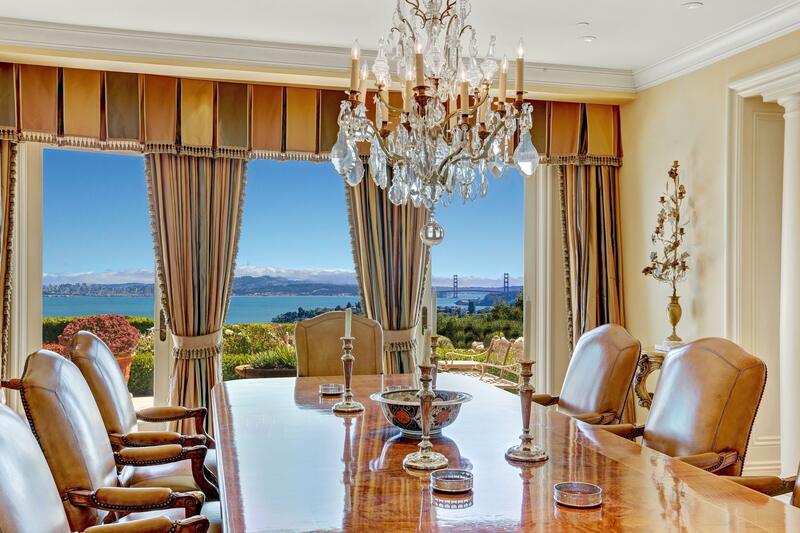 All dimensions are approximate and have not been verified by the selling party and cannot be verified by Golden Gate Sotheby's International Realty. 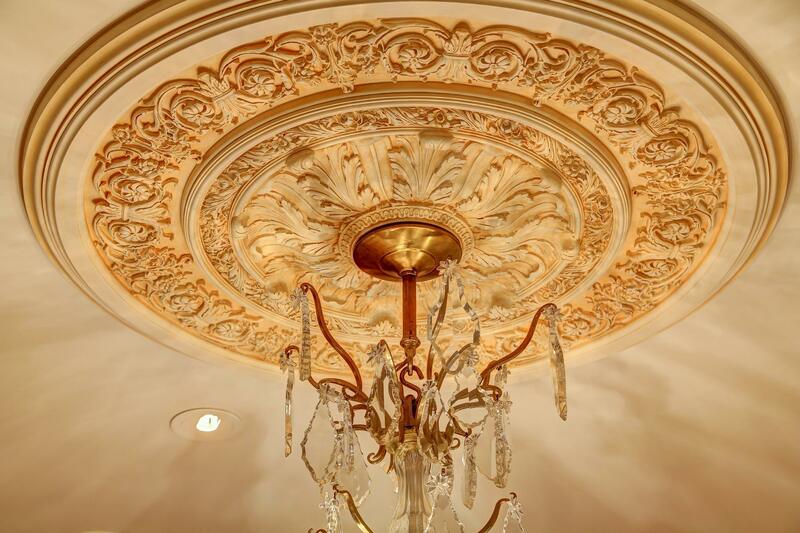 It is recommended that you hire a professional in the business of determining dimensions, such as an appraiser, architect or civil engineer, to determine such information. 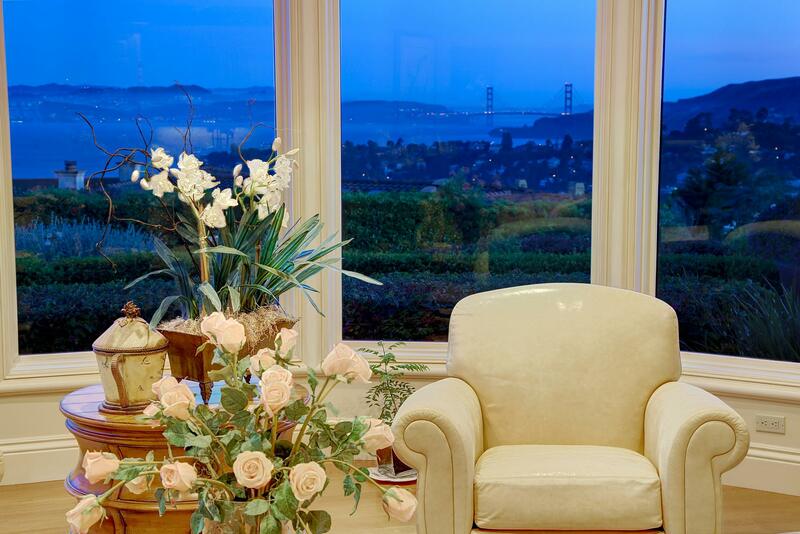 Sotheby's International Realty ® is a registered trademark licensed to Sotheby’s International Realty Affiliates LLC. 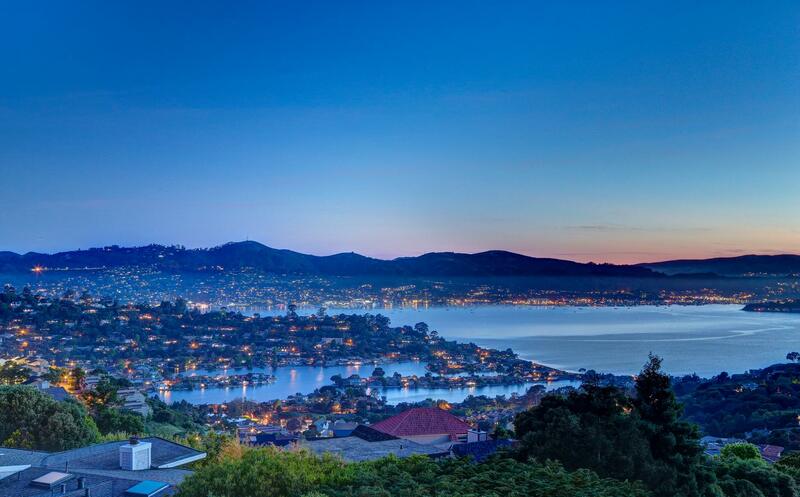 Each Sotheby’s International Realty office is independently owned and operated.